Discussion in 'Effects, Pedals, Strings & Things' started by fenderbender4, Apr 27, 2008. I got my Mosferatu from Hermida Audio. It's been praised to death here, but I just wanted to say how awesome this pedal is. It's so different than any other OD/Distortion pedal I've tried. The voice knob is cool and with the tone knob you can change the timbre of it. It's a very smooth distortion, so I probably wouldn't use it for rock rhythm, but for any lead type thing, it's perfect. Great, great tone. However, with low gain settings, and using it for a sort of semi-clean thing with my strat it adds a fatness to the mids, that sounds really good too. Yep. Everydoby raves so much about the Zendrive and yet the Mosferatu is every bit as cool a pedal imho. I just bought a 3 knob Mosferatu on ebay. Any one know anything about it? The only ones I've seen are the 4 knob ones. 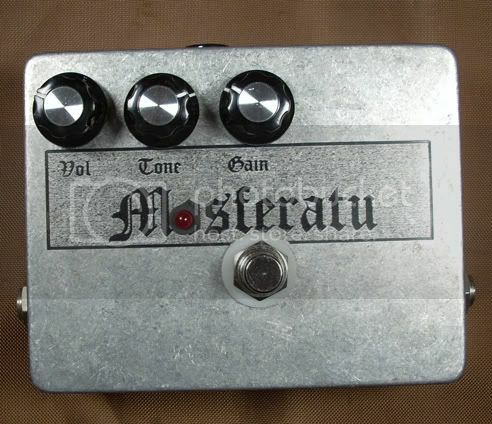 I had one a few years back - IMO it's the 'Warren Haynes In A Box' pedal. Quite thick sounding, but there's still a lot of chording definition even with the gain near maxed. The harmonic content is unreal. ...the version with the "Mosferatu" Vampire graphic? If it's the version I'm thinking...they were what started it off. Lot's of gain, and quiet (as a drive pedal)...big or small enclosure? This has me stoked. I value your opinion highly. I don't know anything about this pedal, but the price was right and, well you know the rest. A Mosferatu just showed up at my house. Very, very nice pedal. The idea of a Zen with more gain kinda scared me away from it for a while, but it's a clean gain....if you can have that. So now I have a Zendrive and a Mosferatu on the board. It is smooth, and super cool. I had the big box Vampire graphic - bought it direct from Alf when the wait was only a couple of weeks. You'll either love it or hate it, JB - it's very thick, fairly compressed, etc. It took me awhile to get my ears adjusted to it. I wound up flipping it (and that Keeley TS-9) in favor of that Blue Boy I had forever and eventually a CoT50 to boost the BB into high gain. Man that's cool looking! Thanks for the feedback everybody. Hmmm. What are your guys' settings on the 4 knob. I gotta be honest, I'm not getting a happy from mine. The key to the tones are if you riun the voice hight keep the tone under 1 oclock. if you rin the tone high lower the voice to 1 or noon.Mind you lowering the voice will cut a little gain, as is not a drive know but it does change the distortion character. I would start with every knob at noon and move them up as needed. It took me awhile to warm up to my Zendrive2 (4 knobber). At first I thought it was too thick and chewy (I'm veering off into hyperbole, sorry), just couldn't get a happy face with it. That was until I pretty much dimed the Voice - it's usually set around 4 or 5 o'clock. The tone control is around 10 o'clock. Still chewy, just a bit more....I don't know....wrecky? My 4 knob Mosferatu settings: Vol (to taste), Gain - 3 o'clock, Tone- 10 am, Voice - 4-5 pm. I don't know what the Voice knob does exactly, but it sure seems to change the character of the pedal. It might shift the midrange center frequency? Also, the Mosferatu is smoother than a Zen2, to my ears. Mine arrived today.. spend an hour with it.. i think is a very nice OD with enough attitude and good feel even at high gain settings. I would like to see some of your settings as well..
That's the one ^^^^^ ! Sorry to bring back an old thread but I have a Mosferatu on the way from Alf and can't wait to get hold of it. I've been reading all about it and it sounds like it's gonna be right up my alley. jb, I've always admired your rig (aswell as erskin's) and we have, at times had almost identical setups. So the fact that you like the Mos so much bodes well for me! Which amp have you been using it with mostly? I too have a Deluxe Reverb so it'd be cool to hear your thoughts on that. And lastly, I've played a Zendrive and loved it, so just how closely are these two pedals related? My rig is my sig. I'm still loving the Mosferatu. I had a Vintage Rat and a BB Preamp at the time that I got the Mos and it just blew them both away. It's the sound of classic rock to me, it's very hard to describe, tons of overtones and very harmonically rich with no hint of any harshness. Let us know when it arrives.